Scrape out the pulp of the vanilla pod. Boil the cream, milk, 120 g sugar and the pulp together with the vanilla pod. Whisk the eggs in a bowl until creamy and then add the hot cream-milk slowly, stirring continuously. Place the small molds next to each other on a deep baking tray and place in the oven. Pour the egg-cream-milk into the crème brûlée molds. Pour boiling water into the baking tray nearly up to the edge of the molds. Close the oven and let the egg mixture set for 40 min. Remove the molds, allow to cool and refrigerate. 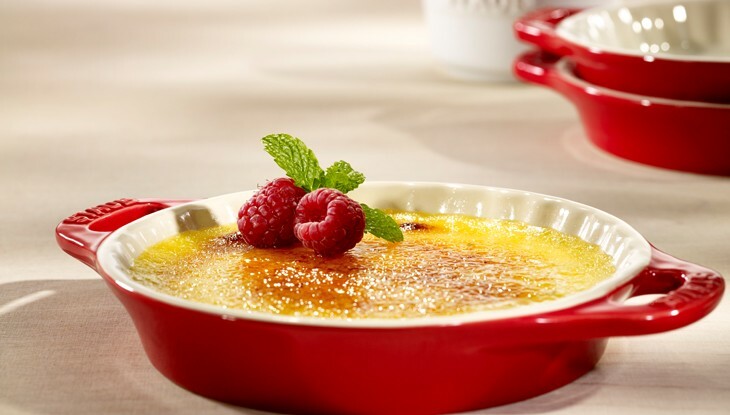 Before serving the crème brûlées, sprinkle with sugar and caramelize with a Bunsen burner or under the very hot oven grill.